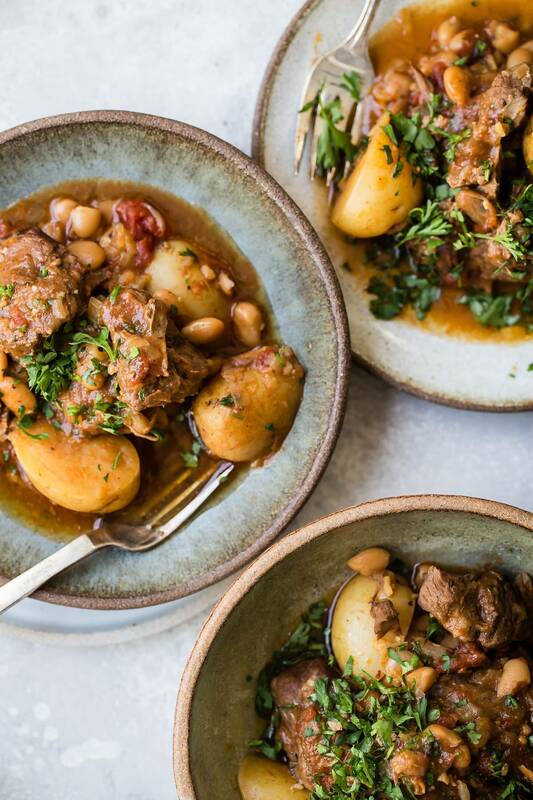 Tender chunks of lamb cooked with tomatoes, spices, red wine, and baby potatoes. This is comfort food on speed dial! I don’t know why I’m so late to the table cooking with a pressure cooker, but better late than never! I can’t believe how amazing it is to cook certain items that would take hours and hours using the regular oven in around an hour! 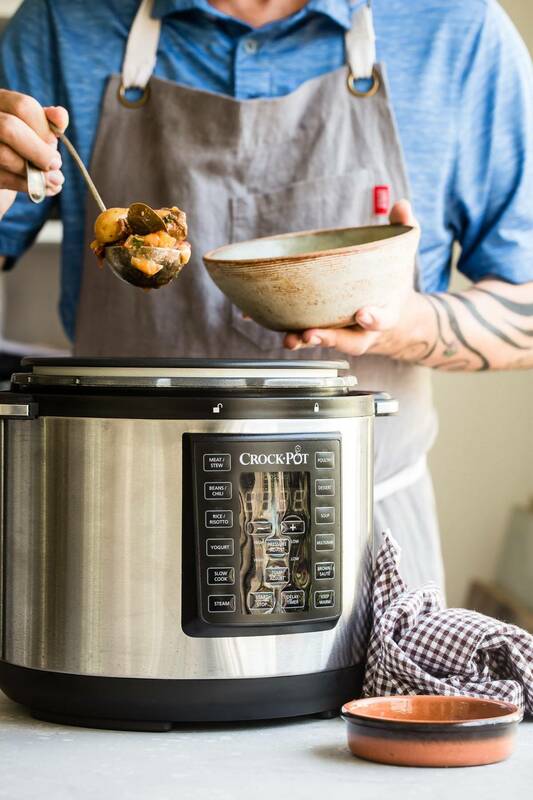 So try and imagine how happy I was to be able to partner with the Crock-Pot® brand and create recipes for Crocktober using their Crock-Pot® Express Crock Multi-Cooker. 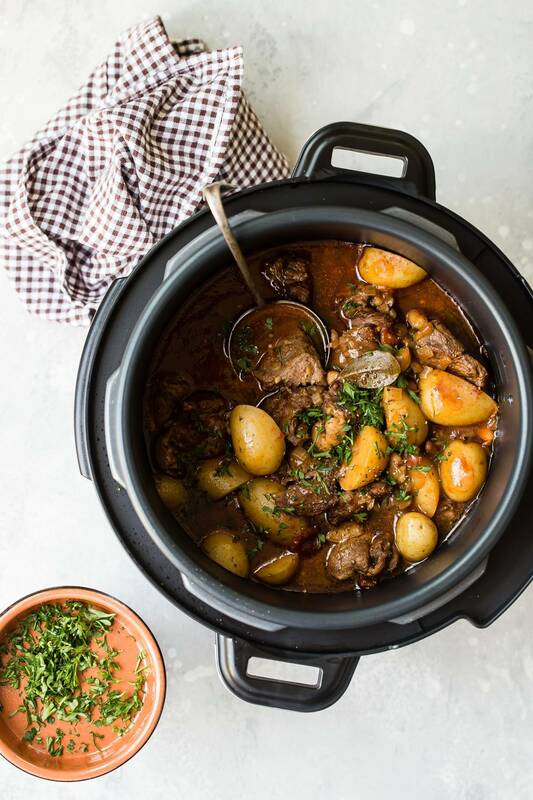 I mentioned about cooking this lamb casserole pressure cooker method but with this appliance, you can also use it for slow cooking! Think about that for a second because if your kitchen is like mine, and jam-packed with all sorts of gadgets, then combining two into one is a genius move. 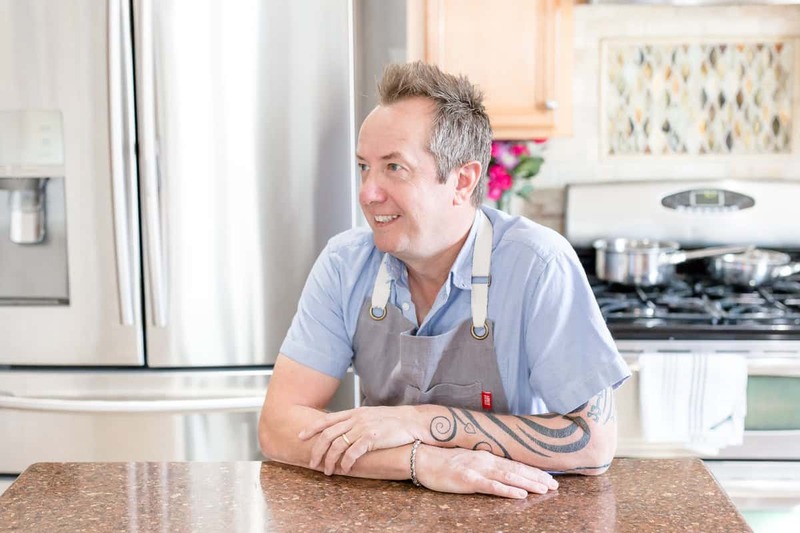 The multi-cooker can cook your meals up to 70% faster than traditional cooking, so that means in my world I can take the kids to after-school activities and as long as I’ve prepped my ingredients ahead of time, I can still have an awesome home cooked meal on the table after we get home. Could it be possible to go a full week without turning on your stovetop or oven? I don’t see why not. 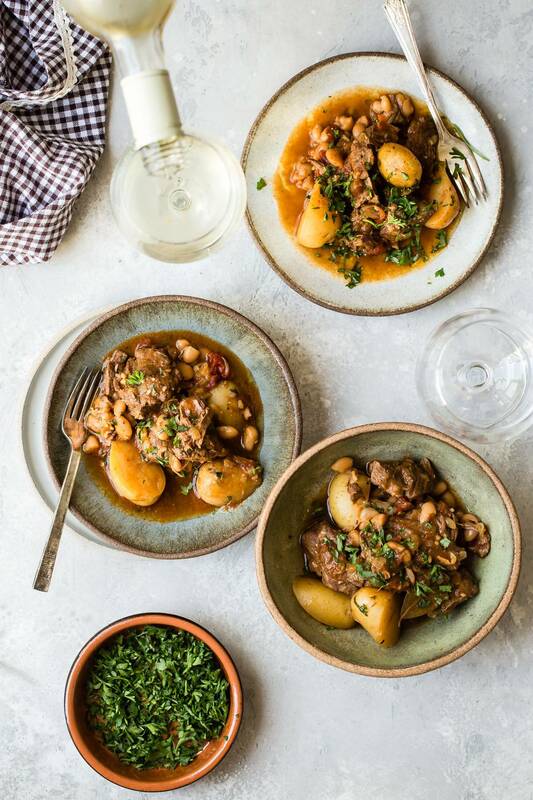 How to make my Lamb Casserole with Baby Potatoes. It couldn’t be simpler, I promise! I used boneless lamb leg and after trimming the fat cut it into large chunks. One rule I always follow when cooking meat over time is to sear it before it gets transferred to the slow cooker. This helps keep in the flavor and the juice while it’s cooking and you get that nice brown layer on the outside. 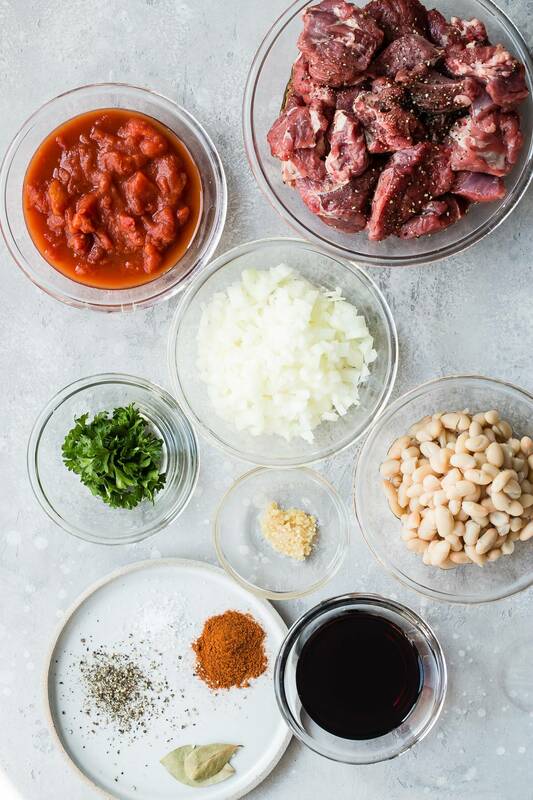 Trying to do this if your using a regular slow cooker takes an extra pan which means more dishes, but the Crock-Pot® Express Crock Multi-Cooker has a built-in brown and sear setting as well as steaming and many other choices. I was a tiny bit skeptical about how well it would sear the lamb chunks because it has to be really hot. And it was, the inside of the pot seared the lamb perfectly in a few minutes so all I had to do was to add the rest of the ingredients and put the lid on. One hour later, I let the pressure out and I was left with tender, melty chunks of lamb and perfectly cooked potatoes with the most outrageous red wine sauce. I can see myself using my multicooker a lot especially through the holidays! Let me know if you’re a pressure cooker fan and what you like to cook with it. The Crock-Pot® Express Crock Multi-Cooker is available in three different sizes – 4-Quart, 6-Quart and 8-Quart – and priced between $69.99 and $149.99, so it can accommodate all of your cooking needs! I can see myself using my multi-cooker a lot especially through the holidays! Let me know if you’re a pressure cooker fan and what you like to cook with it. Let me know if you make this amazing casserole and don’t forget to tag me on Instagram I love to see what everyone is feeding the family. 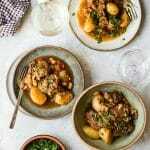 A delicious comfort food lamb casserole with tomatoes, spices, and tender baby potatoes! This is a recipe for a chilly night and can be cooked in one hour! Trim the fat from the lamb and cut into large chunks. Turn your Crock-Pot Express Crock Multi-Cooker on and follow the instructions for browning/sauté. Once the multi-cooker is hot add the chunks of lamb and sear on each side. You’ll need to do this in two batches. Once the lamb is seared on both sides, add all of it back into the multicooker pot. Add the diced onion, tomatoes, paprika, salt and pepper, garlic, bay leaves, salt, pepper, wine beans and potatoes. Stir to combine, place the lid tightly on top and lock. Press stews and set the timer for one hour. Take off the lid carefully and serve big scoops into bowls. Garnish with fresh chopped parsley. Pure comfort food for sure! And hubby approved would be thrilled to come home to lamb for dinner! Oh wow- comfort food at it’s finest! Literally- finest! Wow! I definitely need to invest in a cooker like this. The time saving is amazing. This is beautifully rustic. Talk about a hearty dinner!! 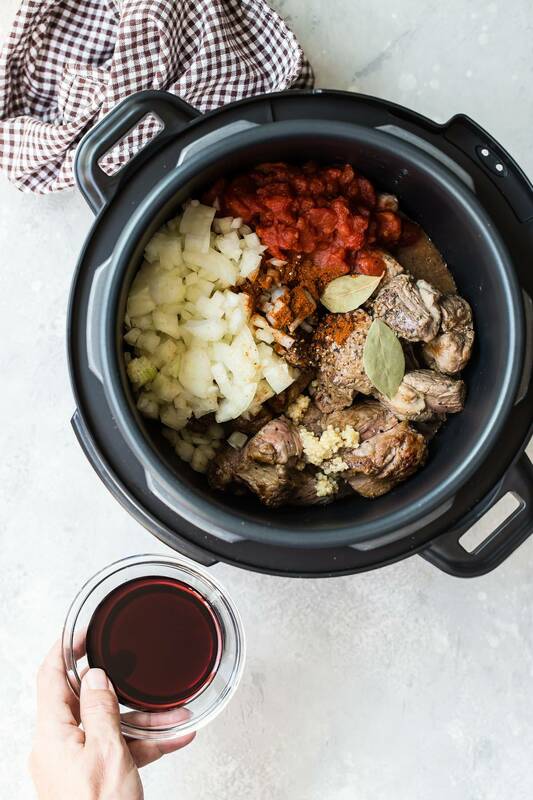 Can this be made in a regular slow cooker instead? ?